I’m not too sure how to describe this dish, it’s like a cross between a pie and a quiche and totally delicious. I found the recipe on Jenny Eatwell’s Rhubarb and Ginger site via Carole’s Chatter Food on Fridays. She has a fun idea, she asks bloggers to link a recipe or recipes, every Friday. Each Friday has a theme and guess what it was a couple of weeks ago, yup Pies and Tarts, in fact, here’s the link, Carole’s Chatter Food on Friday: Pies and Tarts. There were over 250 recipes submitted. I looked at a few of them, I saw this. I had to look, and when I did, I decided that this was just fun enough and different enough to make for Tapas Night. So I did. Make it that is. And it got eaten. There weren’t even any leftovers. I think this would make a fantastic dinner meal, served with a side of veggies, but it’s also a good potluck dish. And you can bake it beforehand, take it out of the pie pan, and serve it at room temperature. How cool is that? Especially down here in the South where you don’t want the oven going and heating up the house in the afternoon. I also made a short crust from scratch, mainly cause I wanted to keep my hand in. And now I think I’m going to make a couple more batches and keep in the freezer, for the times I make a chicken pot pie. This was one of the best recipes I’ve ever made. I found the recipe here, and while I did tweak it a little, it was great. I’ll share the recipe in a separate post. Gotta keep you reading here, one way or another. It has Apples, Bacon and Cheddar in it. I know, what a combination, but oh so very good. However I have to say this up front, I did not cut the apple slices thick enough. Next time, they will be thicker. And next time, I would like slightly thicker bacon as well. I think it would be tastier. Pie Pastry, enough for the top and bottom of the pie (I’ll be posting my recipe in the next day or so for this, but go ahead and use commercial pie crust). 12-14 slices good meaty bacon, cooked slightly crisp and chopped or broken into pieces. Roll out or place one sheet of pie crust in a pie pan. Cut off any overhangs with a sharp knife. Or you can leave it rustic looking. You can either put some pie weights, or some dried beans on the bottom of the crust to keep it from puffing up or just prick the bottom with a fork. I pricked it with a fork cause I don’t have either dried beans or pie weights. Bake for about 15 minutes, or until it is just done. Set aside to cool. Roll out the other sheet of pie crust and set aside for a few minutes. and then cut the cheese into small chunks. Whisk eggs and cream together with a few good grinds of pepper. You know how much you like in your food, and as for me, I did about a half-dozen grinds. Don’t really know how much that was. and kind of shake the pie pan a little so there aren’t any air bubbles in there. I picked up the pie pan and set it sharply down on the counter a couple of times. Like you do when baking a cake, you don’t want any large bubbles in that either. Brush the edge of the cooked crust with some of the egg yolk, this will help to ‘glue’ the top crust to it. Place the second sheet of pie crust on top, and crimp the edges together lightly. Cut off the excess pie dough if you like and use to make decorations with it. Cut a couple of slits in the top, to let the steam escape, and then brush the whole thing with rest of the egg yolk. Not only does this make it look pretty, but you can now ‘glue’ any decorations to it, that you made with some of the leftover dough. Place in oven. I usually put either a sheet of aluminum foil under to catch any drips or just place it on a larger cooking sheet. Bake for about 50 minutes at 350 degrees. Take out of oven and let cool to room temp. Serve. This pie was very easy to take out of the tin, once it had cooled, which made it much easier to slice and serve. I am going to make this again, but I’m going to tweak it a little more. I really liked the combination of flavours, but the cheese got kinda lost in there. I think next time I will add a little more cheese, and in fact will change it up a little and use some Colby Jack Cheese. And as I said before, I will also cut the apple slices a little thicker, they kinda got lost inside. Go ahead and try this for a nice change of pace. Personally, I think I’m going to try taking this on a picnic. It’s hearty, substantial and fun. I saw this recipe for Spanakopita Bites using Pillsbury Crescent rolls awhile back and thought they sounded interesting. I love Spanakopita anyway. And since phyllo dough is a little finicky to play with, I thought the crescent roll dough might be an idea. I don’t usually use prepared stuff like this, and in fact I think this is only the second time in my life I’ve purchased Crescent Roll Dough. I found this recipe on a neat website called Flavors by Four. The website is a mother daughter team of bloggers and I have to say they have some great ideas on there. The following is the original recipe and the changes (tweaks) I made are in blue to the side. I have to say, these were inhaled in short order, and I got a lot of compliments on them. Take out the spinach, defrost it and squeeze out the liquid. I had it in a strainer for an hour but was running out of time, so I just picked it up and squeezed out the liquid. You do want it on the dry side here. Of course I got it a little too dry, so I added a couple of slightly beaten eggs. I sweated the onions and garlic in the olive oil, just til the onions turned translucent and the garlic started to scent the air. I added it to the Spinach and Feta. I also toasted some Pine Nuts, just cause they were sitting on the counter and caught my eye, and I thought Gee, Spanakopita is Greek in nature and Pine Nuts are used in Greece and …. So I popped them in there. I also could not find my dill, but the Za’atar was sitting in plain sight so I added it as well. And then took one package of Crescent Roll dough out of the fridge. I played with a couple of ways of wrapping the spinach in them. As you can see, then I figured it out. Placed them on a baking sheet and baked them for about 15 minutes or until they were a nice golden brown. Just like this. I actually used two packages of Crescent Roll dough. There was more than enough filling for both of them. And it’s a good thing I made so many, they all got et. I brought them to the gathering and added them to the rest of the offerings. This picture was taken with my camera phone and it’s not all that great. As you can see the Spanakopita bites are there to the left, sorta in the middle. 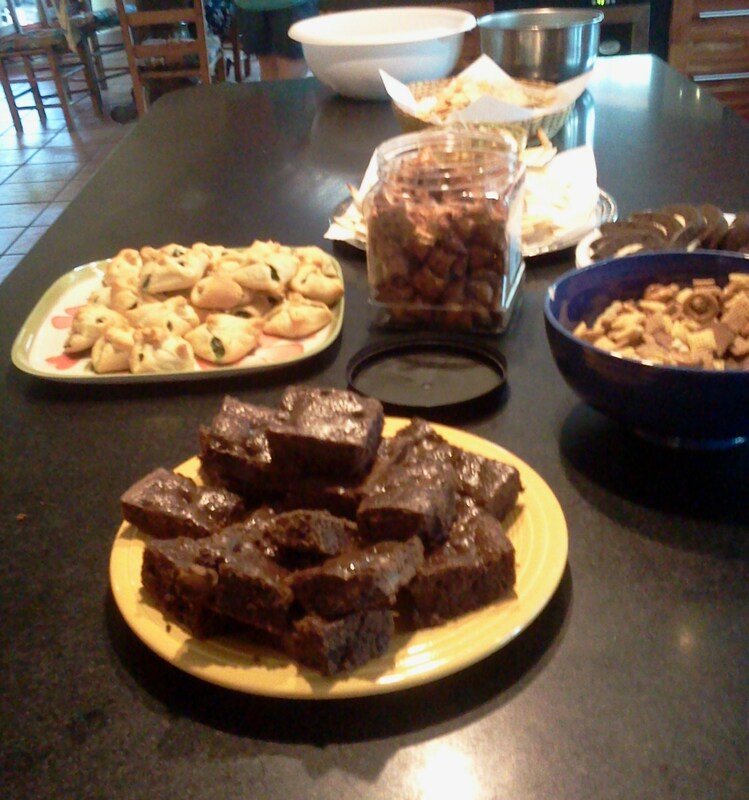 And in the foreground, some really awesome brownies, made with mango’s and tahini. Yeah, Tahini, and a little Frangelico as well. I will share this recipe once I get it. They were really good. Many years ago I fell in love with this spread. It was only available in limited amounts at a local grocery store. They actually would make it and sell it at holiday’s but for some reason only made limited amounts at a time. It was oniony, spicy, and oh so very good. Lately I’ve been on a kind of kick of trying to replicate foods that I really like. Why I never thought I could try to do this before, I have no idea. I made this last weekend and took it to a weekly gathering I attend, and watched people just inhale this. OK, so they scooped it up with crackers, but they loved the taste. To start with, chop up a bunch of green onions, or scallions if you choose. I cut them lengthwise into quarters, and them sliced them across so they were minced. You really don’t want chunks of onions if you can help it. I then took a clove of garlic, from the elephant garlic I had bought, and minced that finely. I went to the freezer and took out a half of a frozen jalapeño and minced it. Dumped it into the bowl and added an 8 oz. 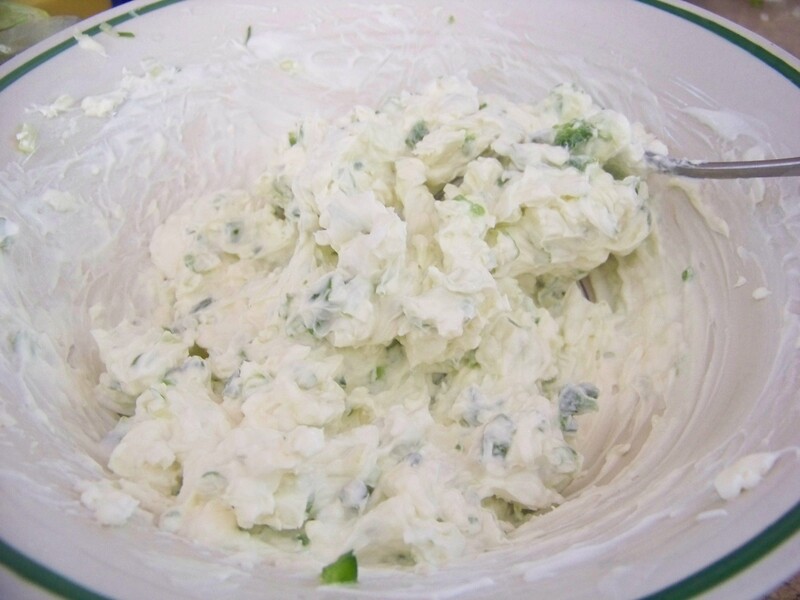 block of room temperature cream cheese, mixed that together with the onions, garlic and jalapeño. Add the sour cream, grated Pepper Jack Cheese, and mayonnaise. Taste at this point and you can add more Jalapeno or more cheese or just leave it as is. 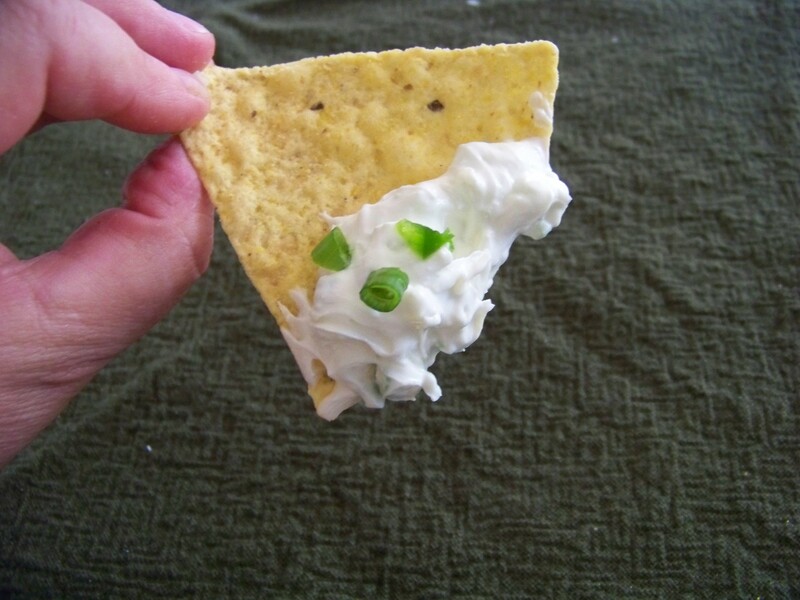 I served this with some Pretzel crackers but it also tasted great with Tortilla Chips. I also think this would be awesome on some baked potato’s, or some fresh french bread or …. Gotta stop now, and go make some more. I’m getting all kinds of ideas. 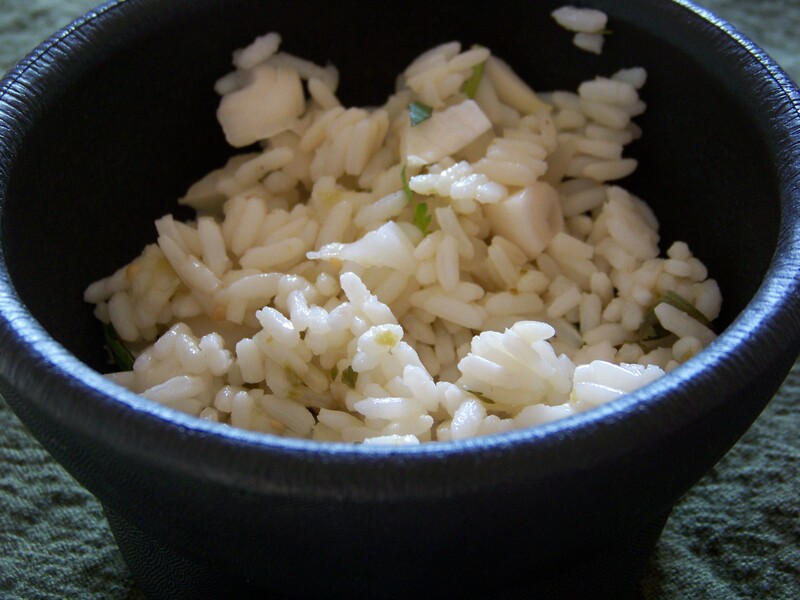 I used to go to a fast food place that served these massive burritos’ which included this wonderful rice. I would order the rice just by itself, and inhale it. I got a craving for it this week, and decided to try my hand at making some. And I think I got it, but of course I will probably tweak it a little more at a later date. But for now, it’s close enough. I liked the slight crunch that the onions gave it without them overpowering anything. I just made enough for myself, so feel free to double or triple the amounts given here. Mix all together and serve. Really, really simple. And I thought very tasty. I think next time I will use just a little fresh lime zest, and maybe even a little chopped jalapeno. I liked the little bit of kick from the Herdez, this is something I usually have on hand, although I bet you could use any kind of green tomatillo based sauce. And since I have some lovely grilled chicken breasts in the freezer, some pinto beans in the cupboard begging to be turned into refried beans and the rice turned out so well, I think a nice big Mission style burrito is in my near future. I’ll share that with you when I do make it. Well, I’ll share the how-to’s and the recipe but not the burrito, that will be all mine. You ever get a craving for a dish your mom made from time to time, but you can’t remember the name of it? I’ve been there lately. Mom used to make this dish, she got the recipe, such as it was, from a friend. I think it was Dutch/West Indies in origin, but despite a few Google searches I’ve not been able to find the name of this dish. Just cause I don’t know the name of something, does not stop me from trying to recreate it though. I think I recreated it just fine. Just a few tweaks needed. I seem to remember we put Chile Sauce on top of this to eat it, but really, I have to say it tasted odd to me when I did it. So I got out the bottle of Sweet Chili Sauce from the fridge, and that was the ticket. Along with the Plantains and Pork and Rice, they all went together nicely. And the fresh figs I caramelized a little weren’t bad either. A friend handed me a bag of fresh figs the other day and as I was making this dish, I decided to throw a few into the pan with the pork. I’m so glad I did. They were so sweet, and caramelizing them a little brought out the sweetness very nicely. No real recipe as such. But since I had some lovely ripe (meaning black) Plantains, I decided that they would be perfect. The picture is blurry, and I apologize, for some reason I didn’t take a couple of followup shots. But this is what your ripe plantain should look like, just like a banana that’s gone totally black. Just peel it at this point, the flesh inside will still be firm. I cut it into slices, and placed them in a greased frying pan. To make this a little more decadent, you can cook them in a little butter if you like. Yesterday I was good, and used some EVOO. Remove to a separate plate and then cook the pork chops. I cooked two because I wanted leftovers. I like leftovers, they make a great breakfast. Just before the chops were cooked all the way through I got one of those AHA moments, and threw in a handful of fresh figs I’d been given. I wanted to see what would happen to the figs and I knew they would go with the pork as well. A little steamy there, but they cooked down nicely. And yes, they went very well with the pork, plantains and rice. The only seasoning I used on any of it was a little salt on the meat, and very, very little grind of salt on the plantains, just as I plated it. Which basically just brought out their sweetness a little more. As I said, I ate the leftovers for breakfast. And made a totally different meal out of the leftovers. I do love a multi purpose meal. 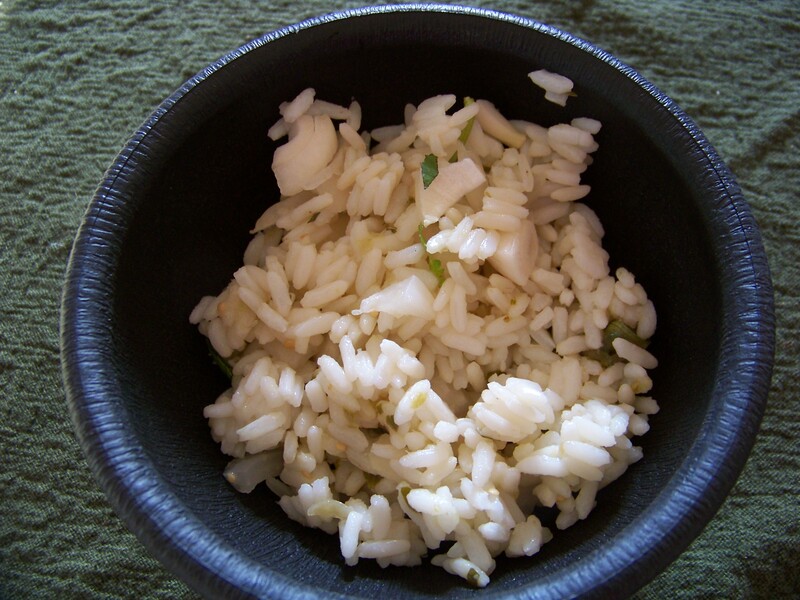 I sautéed the rice in a little olive oil, added some soy sauce, sesame seed oil and some scallions. And it was good.